Programmable and non-programmable digital thermostats. For great prices, sales, repair, installations, and service, call Robison today. 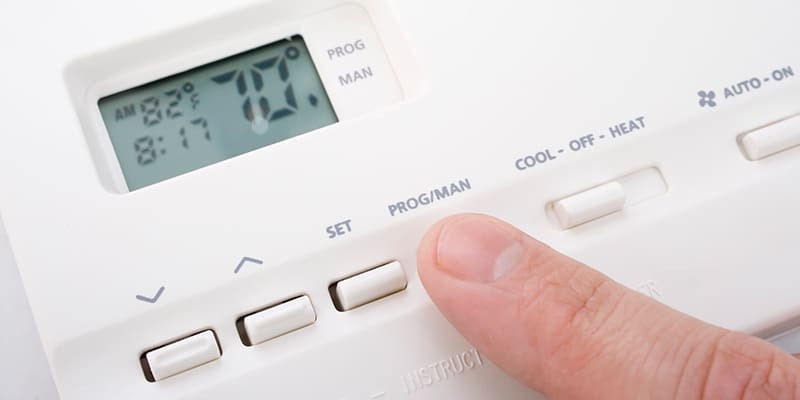 The only way to control your heating and cooling systems properly – and to protect against unnecessary equipment wear and energy costs – is by using a thermostat. A programmable thermostat helps you achieve the very best in comfort, efficiency, and convenience. You simply program the desired indoor temperatures and times of day you want those temperatures, and you are done with your thermostat until the seasons change. You can target variables in temperature needs for automatic adjustments, such as when everyone is out of the home or sleeping. A non-programmable digital thermostat works essentially like an old-fashioned manual thermostat, but with more accuracy. Some also come with more modern features such as outdoor temperature displays and filter-change reminders. To learn more about our support for programmable and non-programmable digital thermostats, please contact us today. Click here to see how these products work.